Rinse the rice under cold water. Bring the broth to a boil in a medium sized or large pot. Add the miso and stir until dissolved and then add the rice while stirring. Reduce heat to medium low, cover and simmer for 45-55 minutes. Preheat a non stick frying pan on medium heat, lightly coat with spray and add mushrooms and saute until they have shrunken a little. Then add onion, zucchini and pppers and saute for 3 more minutes. Now add 1 tbsp of broth from cooked rice, ginger and saute for 1 more minute. 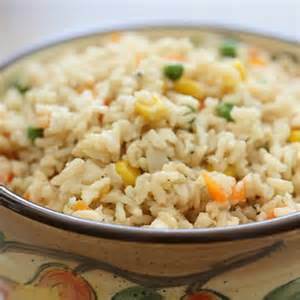 Put veggies and cilantro into rice and stir. Serves 1 large or 2 small servings.